Dissolve yeast in warm water; let stand 5 minutes. Mix yeast with eggs, egg yolks, 1/3 cup sugar, 1/2 cup butter and orange water in mixer. Using dough hook, gradually add dried fruit, salt and flour; knead dough 5 minutes. Heat oven to 100°F, then turn oven off. Place dough in greased glass bowl; cover loosely with plastic wrap. Place bowl in warm place. Let dough rise 45 minutes or until double in size. Punch down dough (stir in flour if dough is sticky). Grease cookie sheet. Form dough into 20-inch log; close ends, forming doughnut shape. Place on cookie sheet. Grease or spray outside of 6-oz glass custard cup. Place upside down in center of dough so ring keeps its shape while baking. Brush egg yolk on dough; top with dried figs and sprinkle with sugar. Cover loosely, let rise about 1 hour. Heat oven to 350° F. Bake 15 to 20 minutes or until golden brown. Cool slightly; remove glass custard cup from center of bread. Cool before serving. 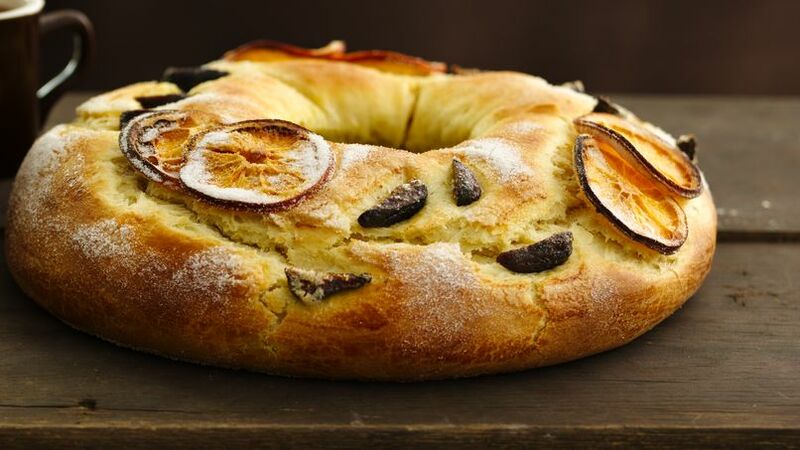 On the occasion of Christmas serve your guests with this delicious baked bread – a perfect Mexican cuisine.